Blissful Balance is a deeply relaxing guided chakra meditation that uses easy energy channeling visualisations to help you clear your chakras of negativity and possible energy blockages. Working with two sources of energy you will clear and re-energise your chakras one at a time, balancing your energy centers while filling you with a deep sense of peaceful relaxation. As you listen and relax into this meditation a gentle healing will move through your energy body, your aura, and stimulate the flow of healing energy to your emotional body and your physical body. The slow pace of this meditation allows your mind to settle and better absorb the positive healing statements. This gentle healing meditation will have a positive effect on your energy body, your emotional body as well as your physical body, increasing your overall sense of well-being. Think of it as a spa treatment to heal and refresh your energy, your aura and your chakras. 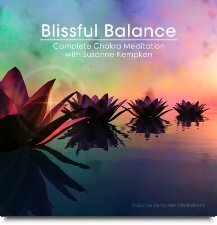 Blissful Balance is a wonderful, deeply relaxing all around chakra healing meditation that is a valuable addition to any meditation collection. Blissful Balance works with source energy and earth energy to channel gentle, powerful healing energies to every part of your being, specifically through drawing these energies into your individual chakras. Personally I believe that it is important to work with both the higher forms of energy as well as the more grounding earth energy. Your lower chakras are all about living in the physical world and in terms of healing it is highly beneficial to incorporate earth energy into a full chakra healing meditation. If you are looking to address underlying blockages in specific chakras, I suggest that you try my individual chakra meditations. These meditations use chakra specific positive affirmations to encourage deep levels of healing. While this guided chakra meditation is designed to help you meditate through the use of guided visualisations, you will still receive the healing benefits if you listen without actively following all the visualisations. You can also fall asleep to this meditation and still enjoy the flow of healing energy while you sleep. Susanne suggests that you listen to this meditation regularly for a certain period of time to activate a deeper level of healing.